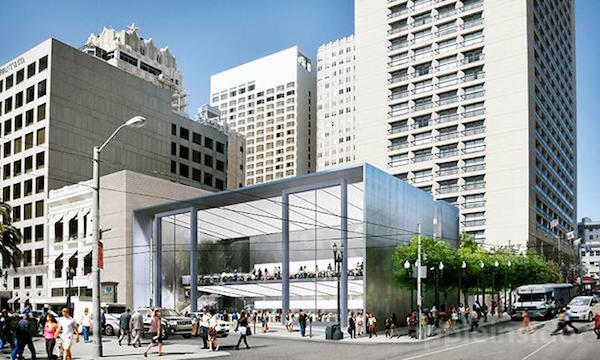 Not content with big media briefings for new product releases, Apple is now doing something similar for new Apple Store openings after putting together a preview event for the company’s new flagship store, Union Square in San Francisco. Set to open to the public this coming Saturday May 21st at 10:00AM, replacing the old store at Stockton Street location, the new store features a whole new redesign that makes it look nothing quite like the Apple Stores that came before it, and it looks absolutely stunning, but then again, given the two years it has taken for the store to be set up, it really ought to look good. With Angela Ahrendts on hand to show those in attendance just what the new wave of Apple Stores will likely bring to the table, this store in particular has taken things to an all new level, with things like 42-foot glass doors that slide open a whopping 40 feet to make the front of the store effectively open to the elements. There’s a 6K screen that runs the length of the store as well as a new area where buyers can test accessories out, making this a mighty impressive sight to behold. 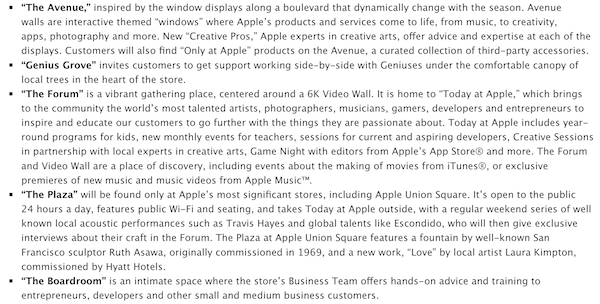 If you thought you were growing tired of the existing Apple Store design, then this will certainly excite. Around the back of the store, there is room for 200 people to sit and admire the feature water fountain, amongst other things, and there is even a special area for small business customers, complete with sofas, a large screen TV and a conference table. When the store opens to the public on Saturday, we think things might be a little busy. Only then will we know how well this new design stands up to the the biggest test any store can endure – can it cope with a busy Saturday’s trading?